I cut this out of the Wall Street Journal (I think it was WSJ). 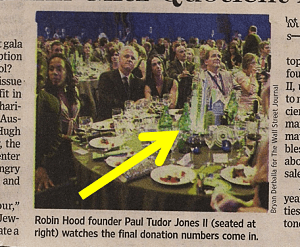 It was a story about the Robin Hood Foundation’s 2009 auction fundraiser. I saved it because of the auction centerpieces. What in the devil IS it? Can anyone tell me? I can’t quite make out the details. It appears the centerpiece had some sort of skyscraper “skyscape” theme, perhaps representing the location of the Foundation, which is in New York. Or maybe it’s a crown? I didn’t save the article, but I remember the story alluding to the centerpieces as being less glamorous than in past years. They were downgraded as part of the Foundation’s cost-conscious planning this year. And hence, we’ve reached the point of this blog post: Good ideas as it relates to centerpieces. Friends, you won’t ever secure more donations from your guests because you have fabulous centerpieces. I also know the article went on to say that after severe cost cutting, they were able to raise more money at this auction than the $56.5 million dollars they raised in 2008. Sweet! I talked with one of the auction vendors who had a contract to work this event. It was, in her words, “Sick.” (in a good way). That picture is a little easier to see and it looks to me like they are using informational placards in their centerpieces.Can’t tell if the bottles are part of the display or part of dinner. Thanks for taking the time to research this, Kimberly! Your photo is certainly clearer than mine … and — like you — I’m still a little unsure as to what it is. 🙂 Good guess on your part, I’d say. 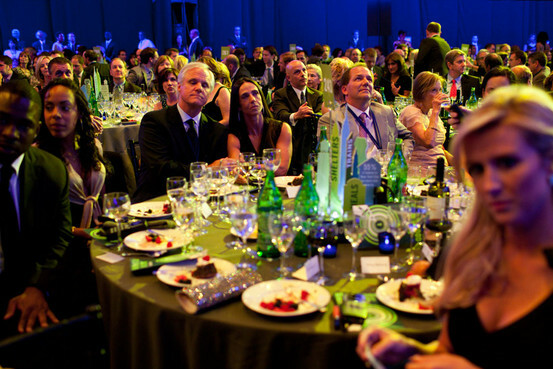 The centerpieces contained individual IML devices which allowed attendees to make anonymous donations from their tables. I guess the skyscraper-y shape we vaguely see is actually the device poking up. Good work designing your centerpieces to be functional instead of just “pretty.” I think there’s a blog post hiding in that idea….